Hampton Roads was a fabulous rally, and Hank and Stevie did a great job. Of course, as Hank readily admits, Stevie was the organizational powerhouse behind this rally. What a privilege to tour Naval Base Norfolk and go on board an active war ship thanks to Hank... the same type of ship that has just launched missiles at ISIS in Syria. All of our members have done amazing things in their lives if we only knew about them. Hank and Stevie are no exception. I hope you enjoy this video of our rally. To those of you who attended the rally in Virginia Beach, THANK YOU. We know you came from your summer travels all over the country. To those of you who couldn't make it, so sorry you missed one of our all-time great rallies... and SECC has great rallies. We had 31 coaches, 5 of whom were guests. Stevie and Hank Giffin did an outstanding job of creating a very special rally, filled with group tours, lots of free time to visit the many sights nearby, plus good get-togethers for socializing. ​THIS was the view, of the ocean, not me, from Waterman's located right on the beach. Our visit to this very nice seafood restaurant was included in the rally fee. This was one of our higher priced rallies since we didn't want to cut any of our great activities from the rally. The plan worked out very well. Everyone attended every event so we could get reacquainted and to know the guests as well. After a morning in Norfolk touring the battleship USS Wisconsin and Nauticus maritime museum, we had a relaxing sail in the harbor on the schooner American Rover. We were able to get close to the civilian shipyards that repair the warships. Separate white ships sat alongside as barracks for the sailors. L to R: Jack Cassingham, Jack Conway, Kent McCoin, Charles McGairty, Hank Giffin. Doesn't this site look familiar? You can always find men in deep discussion at our rallies. ​Because Hank is retired 3-Star Admiral we were treated to a very special private tour of Norfolk Naval Base, the largest naval station in the world, and tours of ACTIVE warships! A young officer on our ship explained that they only give tours of active warships to dignitaries from the government or military. What an honor. THANKS SO MUCH HANK! The rally was broken into two groups , one viewing the USS McFaul DDG 74, shown below. It was a great surprise aboard our ship when greeted with coffee and donuts! ​Of course the rally schedule left plenty of free time to either explore the area. Plenty to see there in of lighthouses, museums, nearby Williamsburg or Jamestown. Some members just relaxed in the campground. The accommodations were excellent at Holiday Trav-L-Park of Virginia Beach, plenty of room at each site. Above, Marylou Cassingham dances with Chris Rogers. This club knows how to have FUN. See y'all at our next rally March 11-15th in New Orleans. Members Ann & Buddy Bordes, residents of metro New Orleans, are our hosts. 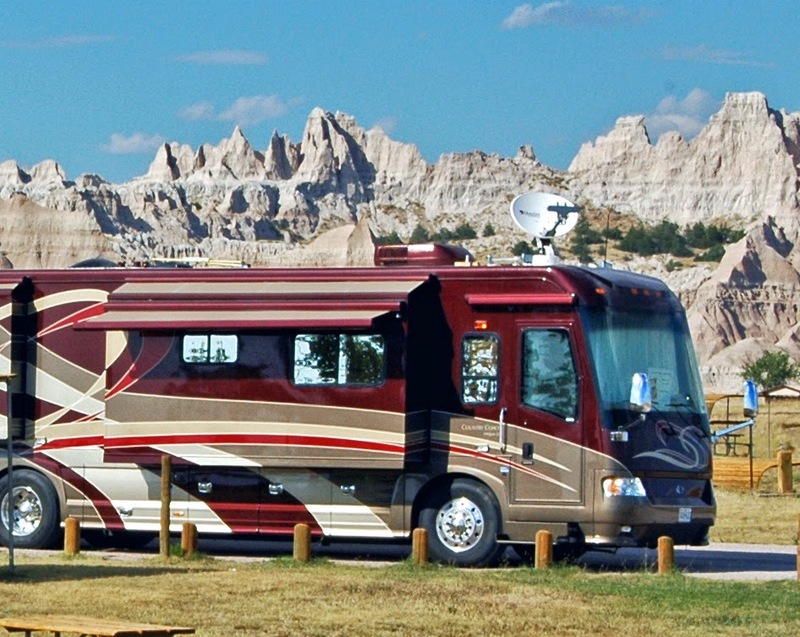 Lee Zaborowski, president of Country Coach International, sent us a picture of his and his wife Jeanne's Intrugue taken in 2011 on a trip out west. They went from their home in Branson, MO back to the Iron Range of Minnesota to visit son Alex and Jeanne's sister Joanne. Then they visited other relatives in Grand Rapids MN (Judy Garland's childhood home). From there they crossed the continent on U.S. Hwy 2, stopping at the Badlands and taking a tour of Glacier National Park. They continued on to Portland, OR where they visited daughter Chris and family. From there they traveled north into Washington state before heading back home to Branson. What a trip. Good to hear from you Lee, and thanks for the beautiful coach photo. We look forward to seeing you at Virginia Beach.